I love this salad. It is a fresh, and lighter, replacement for beans and rice with any Mexican dinner. In a small mixing bowl, combine the vinegar, lime juice, honey and cumin. Slowly whisk in the oil until incorporated. Season with salt and pepper. 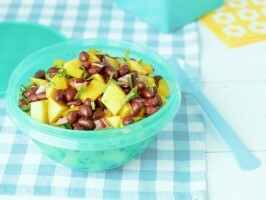 Mix the mango, pepper, beans, jalapeno and onion together in a large bowl. Drizzle the vinaigrette over the ingredients and toss to combine. Season the salad with salt and pepper. Garnish with the cilantro.